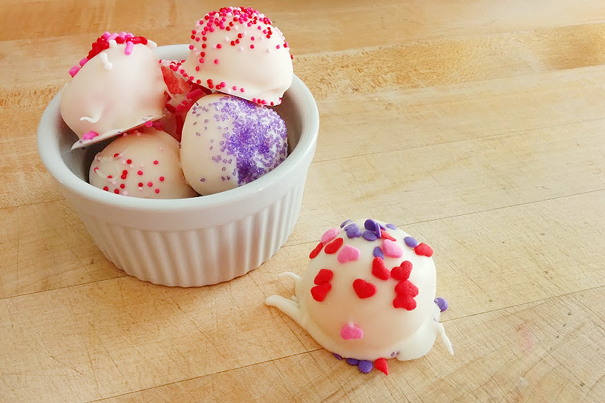 Strawberry cake mix truffles are a super easy Valentine’s Day treat. They’ll have everyone oohing and ahhing, in between bites. It just so happens that today is my birthday. Being born so close to Valentine’s Day, I often ended up with strawberry flavored birthday cakes. Not that I mind. You might be anti-cake mix. Most of the time, I prefer from scratch cakes, myself. But there’s something about strawberry cake from a box that I simply can’t walk away from. Wanting a sweet little treat for my Brit this year, who happens to love strawberry cake as much as I do, I decided to experiment with a box of Pillsbury pudding-in-the-mix strawberry cake mix, some cream cheese, and enough Valentine’s Day sprinkles to make even Elle Woods jealous of the pink. Now I know, a lot of people don’t consider cake mix an ingredient. Which is fine. To each his own. 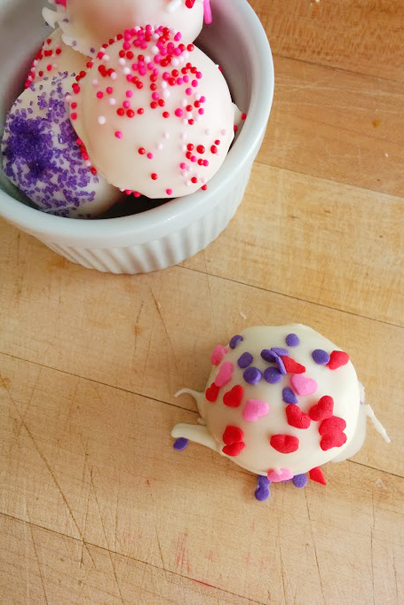 These little cake mix truffles are ridiculously sweet and decadent, and couldn’t be easier. When you need a few tricks up your sleeve for a quick Valentine’s Day party treat? This is it. They’re not any more work than making and frosting cupcakes, and in fact use less bowls. But their wow-factor is pretty huge. I mean, you made candy. At least, that’s how it looks to little kids and husbands. That’s good enough for me, you know? Not to mention biting through that candy-shell provided by Candiquik is completely addicting. As for sprinkles? Everything is better with sprinkles, amiright? I put sprinkles in the filling and on top of each truffle. Because: sprinkles. I have yet to find an organic strawberry cake mix, but if they exist, let me know! You could also try this with an organic vanilla cake mix and a box of strawberry jell-o. 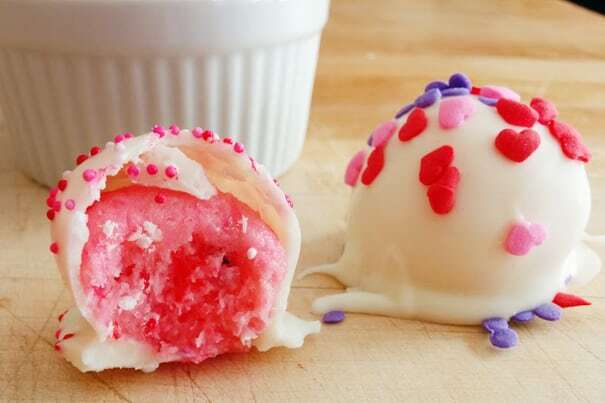 Or just make vanilla cake mix truffles. The sprinkles will do the heavy Valentine’s Day lifting anyway. In the bowl of a stand mixer, beat softened cream cheese until light and fluffy. Pour entire bag of cake mix into the mixer and beat on medium speed until the cake mix and cream cheese are well combined, scraping the sides of the bowl often. Add powdered sugar and sprinkles and mix on low speed until completely combined, scraping the sides often. Using a small cookie dough scoop, scoop dough onto a jelly roll pan lined with parchment paper. Freeze the truffles for at least 20 minutes. When truffles are frozen (they'll be slightly soft, even when frozen), heat one candiquik tray in the microwave according to the directions on the package. Working quickly, dip truffles into the candiquik while it sits on a fork. Lift the fork out of the candiquik, allowing the coating to drip off. Place each truffle back on the parchment paper. Wait for the first layer of candiquik to harden, then repeat this process. Heat the second tray of candiquik when you run out of the first. 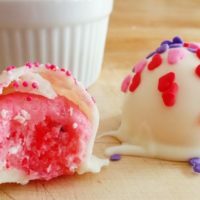 In the second coating, work with only two truffles at a time, stopping to sprinkle valentine's day sprinkles over the top of the wet candy coating. If you wait too long, the sprinkles will not stick. 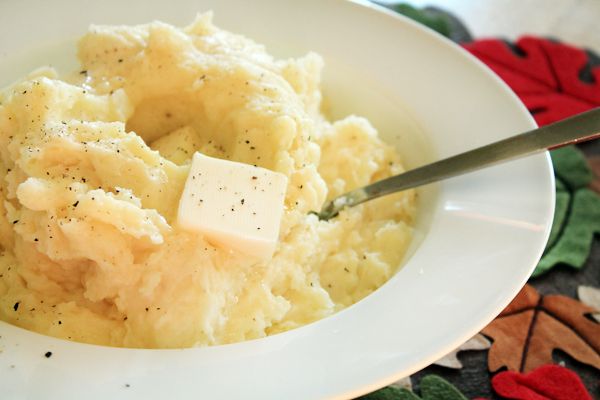 Store in the refrigerator until ready to eat, for up to 5 days. Yum! I love strawberry cake and these look amazing! BTW: Happy late birthday! This looks like a perfect “make with the little girls” sort of treat for V Day. Too risky to maybe add some KAF jammy bits in there? I like the idea of something in the middle, but know that the jammy part doesn’t take hold until after they’re cooked. I don’t think the jammy bits would work texturally, friend. I love to eat them by the handful.. but these cake truffles are so sweet already, and then the gummy texture would kinda throw you off. Stick with sprinkles or maybe white chocolate chips. What a pretty pink! I have never made cake truffles or cake balls; isn’t that weird? Laura, it’s not that weird. This was my first ever attempt. You’ll notice in the instructions I tell you to double dip. That’s because I found a single dip wasn’t enough – first, you could see the pink through the white candiquik, and secondly, as they warmed up from the freezer, the cake filling started to escape and push through the candy shell in weird wormy ways. First, my eyes popped out of my head. Then I tried my second batch with the double dip. Two coats of candiquik is strong enough to hold the cake filling in, no explosions. Happy, happy birthday Amber!!!! These treats look like a cheery pink way to celebrate. Strawberry cake is one of my faves too. Thank you, Kathryn! We had a great dinner out, complete with margaritas. Can’t really ask for more than that – plus, the baby slept through the entire meal! Happy birthday! Enjoy your dinner! Believe it or not I have never had strawberry cake mix…what is wrong with me?…lol. Love these valentine’s day treats. How have you never had a strawberry cake, girl?! Dinner was fabulous, as was the margarita that accompanied it! I totally agree, Casey. That’s why I’m having Mexican food (not cooked by me!) with a few of these truffles as a chaser.